Randy Orton gave AJ Styles a deadly RKO after the two exchanged heated words on the KO Show. Randy Orton dealt AJ Styles a psychological blow ahead of their WrestleMania match with a huge RKO on this week's SmackDown. The blue brand completed their preparations for Sunday's event, which is live on Sky Sports Box Office at midnight, with an appearance by the pair on the Kevin Owens Show. How to see WrestleMania on Sky Sports! Click here to order WrestleMania 35 live on Sky Sports Box Office! To begin with, only verbal attacks were traded, with Orton pointing out that Styles has spent his life wrestling on the independent scene while he was performing at WrestleMania. Styles responded by taking it to the next level and pointing out that, in between those WrestleMania appearances, Orton failed a drugs test and was suspended by the company. With a line clearly crossed, Owens made a sharp exit and the two went toe to toe, with Styles getting the upper hand immediately. But as he went for a Phenomenal Forearm, the Viper seized the moment to nail a big RKO and leave Styles down and out days before their huge head-to-head in New Jersey. Alexa Bliss announced that The Usos will defend their SmackDown Tag Team Titles against Aleister Black & Ricochet, The Bar and Shinsuke Nakamura & Rusev at WrestleMania. Four of the best tag teams on SmackDown paired off and squared off as SmackDown tag champions The Usos teamed up with Aleister Black and Ricochet to take on The Bar and Shinsuke Nakamura and Rusev. All eight superstars had their moments before The Usos had Rusev on dream street and put him away with a massive double superkick for the win. Jimmy & Jey began to celebrate, but they were interrupted by WrestleMania 35 host Alexa Bliss, who had a major announcement: The Usos, after their forfeit against the New Day in the tag team gauntlet match last week, would now have to defend their titles against all three teams they just shared the ring with. This monumental news clearly led to a massive brawl to break out, and Black & Ricochet stood tall when the dust settled. 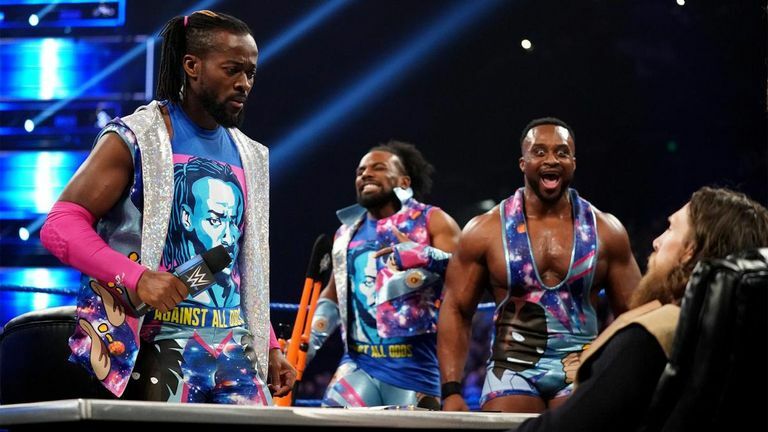 Daniel Bryan spent a long time preaching to the WWE Universe about Kofi Kingston's flaws until The New Day member had heard enough and claimed he was going to become WWE Champion at WrestleMania. To a huge ovation from the arena crowd, Daniel Bryan and Kofi Kingston signed their names on the dotted line for their WWE title match at WrestleMania. Book WWE WrestleMania on Sky Sports here! WrestleMania gold: Hardyz return to WWE! Bryan stressed that Kofi has been complacent and a bystander in his own life and career for the past 11 years. An irate Bryan claimed that Kingston's current position was more "fad" than "reality." The WWE champion told Kofi to take all of this in, because it would never get any better than this for him. That last claim finally drove Kingston over the edge, as The Dreadlocked Dynamo emphatically told Bryan that he was ready for this opportunity and that the only commonality between him and Bryan was that Bryan already knows what it feels like to be WWE champion and that, after Sunday, Kofi would know too.